Paramedics assisting the suspect that was shot in the back by his victim following a robbery in Springs. Pic: Springs Advertiser. One of three armed suspects is reportedly in a critical condition after he was shot in the back during a business robbery in Springs on the East Rand. The three armed suspects allegedly robbed a man and two of his workers at gunpoint yesterday. The owner of the business said he was about to open the door when three armed men pointed guns at them and ordered them to sit on the floor, Springs Advertiser reported. Springs police official, Amanda Greybe said the suspects searched the victims and took three cellphones, a tablet and an undisclosed amount of money before running away. The business owner had his firearm with him, which the suspects did not see, added Greybe. “When the suspects ran away, the owner of the business and his sister chased after suspects to Sixth Avenue, where he saw one of the robbers and shouted ‘drop your gun, or I will shoot’,” said Greybe. It is believed the suspect fired at the owner, who also opened fire and wounded the robber. 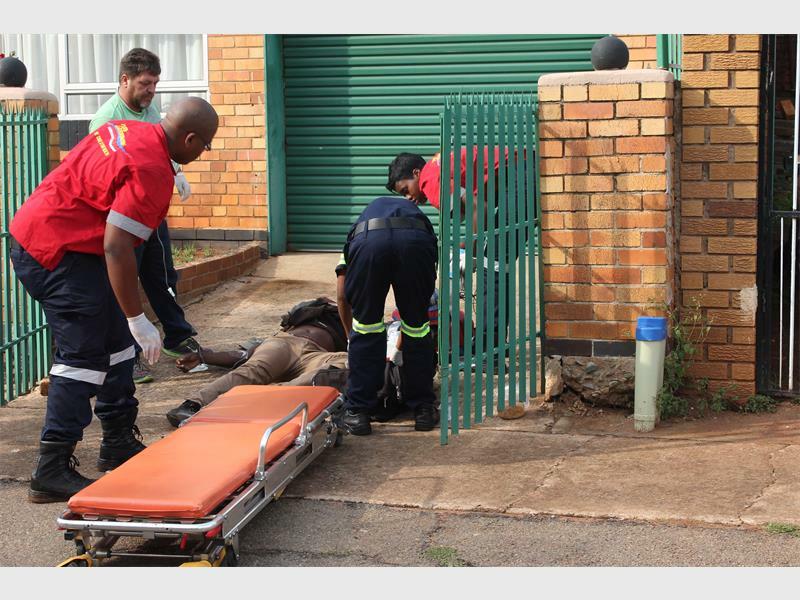 The suspect was treated on the scene by paramedics and taken to the Far East Rand Hospital (FERH) for treatment. FERH spokesperson Hendrik Buda confirmed the suspect was admitted at the hospital. “The patient was rushed to theatre upon arrival and is in ICU in a critical condition,” said Buda. Greybe said another suspect was caught in East Geduld Road shortly after the shooting. Most of the stolen goods were recovered. In a separate incident, a suspected robber was shot dead, while a police officer and another alleged robber were shot and injured in an armed robbery in Marble Hall, near Bela Bela, Limpopo last month.